With the summer season coming to an end, and the fall auction season starts, the market seems to be taking a cautious approach when it comes to the diamond industry as a whole, even for those rare Fancy Color Diamonds. We know that the diamond industry has been going through some turbulence times since late 2014, and some don’t see the light at the end of the tunnel. On the other hand, some do, and are quite optimistic, especially those in the Fancy Color Diamonds arena. Why is that? As auction houses prepare for the last few months of the year, the major expectations from the market are looking forward to the most exciting and busy auctions of the fall/winter season and that is in Geneva on November 15 and 16 where both Sotheby’s and Christie’s are expected to showcase yet some of the most exciting pieces of the year. On September 22nd, Sotheby’s will be holding its New York Important Jewels auction. We can see uncertainty by the fact that only a single item is valued at over $1 million. It is a 27.35 carat, oval shape, D color, VS2 clarity and type IIa diamond. It is valued between $2 million and $2.5 million total or $73k to $91k per carat. Quite humble, but due to a low clarity, it can be understood. In Agreement with the FCRF (Fancy Color Research Foundation), prices of yellow diamonds have softened in the last quarter. Being that there is an abundance of yellow diamonds in the market (in comparison to the rarer pink and blue hues), prices in the more commercial goods have softened, and some dealers are lowering prices slightly in order to move inventory for potential opportunities. The majority of acquisitions are being done by industry insiders rather than by consumers. We can see this as both a positive and a negative implications. On one hand, it is positive as some dealers are going out to the market and acquiring goods which will eventually sell to consumers, but are taking advantage of those dealers that need that extra cash flow. I can honestly say that the value of such items have not really decreased, it is only a superficial decrease in prices, and not due to lack of demand. On the other hand, knowing that the majority of activities are being done within the dealer circle rather than moving along further in the value chain and onto consumer must be viewed with caution. 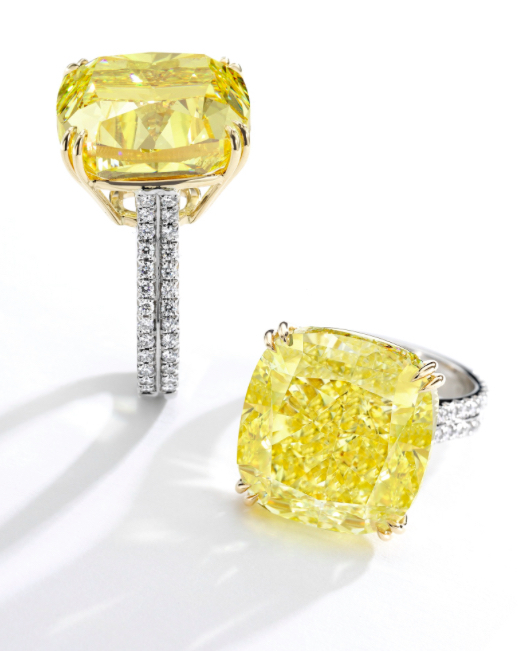 The most expensive Fancy Color Diamond item in the upcoming New York auction is a beautifully made, 30.71 carat Fancy Intense Yellow diamond, cushion shape and a VS1 clarity. It is valued at between $675k to $775k or $22k to $25k per carat. There is value in this price range, and we shall see some price increase over the medium term in yellow diamonds. When reviewing the items at an auction, I usually review them by valuation, highest to lowest. As you can imagine, the moment I saw only 1 item above $1 million valuation, my excitement was decreasing by the second. Going down the list passing down the $500k mark, $400k, $300k and even the $100k, losing hope; until I get to lot #55, and as it is well known in the middle eastern tradition that 5 is a lucky number! 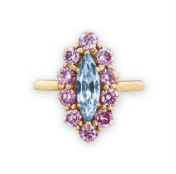 Item #55 is a ring, with colourless diamonds, but right smack in the middle of it, a 0.79 carat treasure is placed; Fancy Intense Blue diamond and a VS2 clarity. Eyes light up, as I am looking at the estimation given by Sotheby’s, i laugh but it makes sense to me that they are trying to somewhat manage expectations, but those that know the market, know very well, that any blue diamond is a hot commodity, and will literally sell like “hot potatoes”. Valuation given is $60k to $80k or $76k to $101k per carat. Rest assured that this is not a bargain! what do i mean? anybody looking at this item, knows for certainty that the actual sale price will be well above the estimates, to say the least. Therefore it will end up selling for its true value and then some. That is why I described it as not being a bargain. Just as a piece of information, the current record holder for a Fancy Intense Blue under a carat is a 0.85 carat FIB sold on November 25, 2014 in HK. it got sold for a total of $191,666 or just over $225k per carat. Has Harry Winston lost its Brand Power? After reviewing the blue, I was certain that this was it for the auction, but continued to scroll down the list…until I got to the 2nd lost treasure! 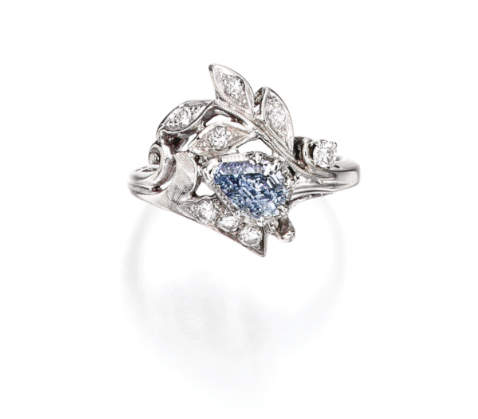 a beautiful and delicate Harry Winston ring. 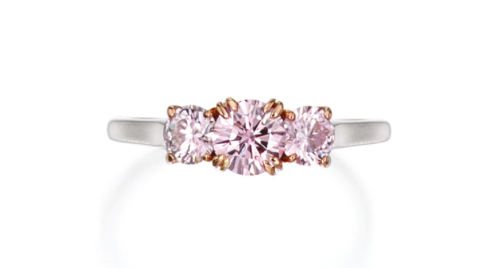 It has a 0.47 carat, SI1 clarity, Round shape Fancy Intense Purplish Pink diamond at its centre. Here too I could not believe the valuation, and had the same conclusion as I did for the blue…. 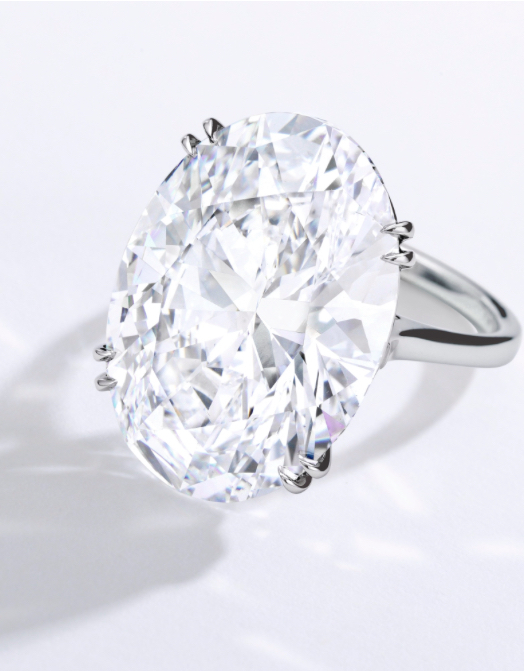 Sotheby’s valued it between $25k to $35k total or $53k to $74k per carat. Obviously this is not your typical $1 million+ diamond where there will be a standing ovation, but still there is value to any pink diamond due to its rarity in the market. At its current valuation, it is also a bargain. Not to mention that it is a Harry Winston ring. We know how strong this Brand is. Fall and Winter auction season are heating up and the auction houses are holding on to secrecy what they have behind closed doors as much as possible trying to keep an edge over each other. We know that Geneva in November will be the major event of the second half of the year, just like it was for the first half of the year back in May, where both Sotheby’s and Christie’s had unique items that sold for record prices. Auction House Fails to Report Unimaginable New Record Price!